The origin of one of the most famous quotations in British football history has been revealed, seven years after it was uttered. The Frenchman Eric Cantona, who was a star at Manchester United at the time, gravely told a news conference that "when the seagulls follow the trawler, it is because they think sardines will be thrown into the sea". But an official at the club has disclosed that far from having a deep philosophical meaning, the quotation had a more humble origin. 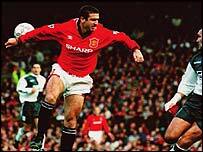 In 1995, Eric Cantona was at the height of his powers. But after being sent off in the game against Crystal Palace, he lost control of his emotions as he walked to the dressing room and launched a martial arts-style kick at a fan he alleged had verbally abused him. Sentenced to 100 hours' community service for assault, Cantona's actions made worldwide headlines. But his only comment to the press after his conviction was that one sentence. Many believed it was the work of a little known French philosopher; others thought that Cantona had shown himself as a deep and enigmatic thinker. But Michael Kelly, the former head of security at Manchester United has revealed in his book that the quotation had been assembled by a number of people including Cantona in a London hotel room. Mr Kelly himself was asked by Cantona and his agent for another word for fishing boat - hence trawler. He was also asked what small fish were called. His response was "sardines". And so the phrase "When the seagulls follow the trawler, it is because they think sardines will be thrown into the sea" was born and earned Cantona the philosopher a place in football history.